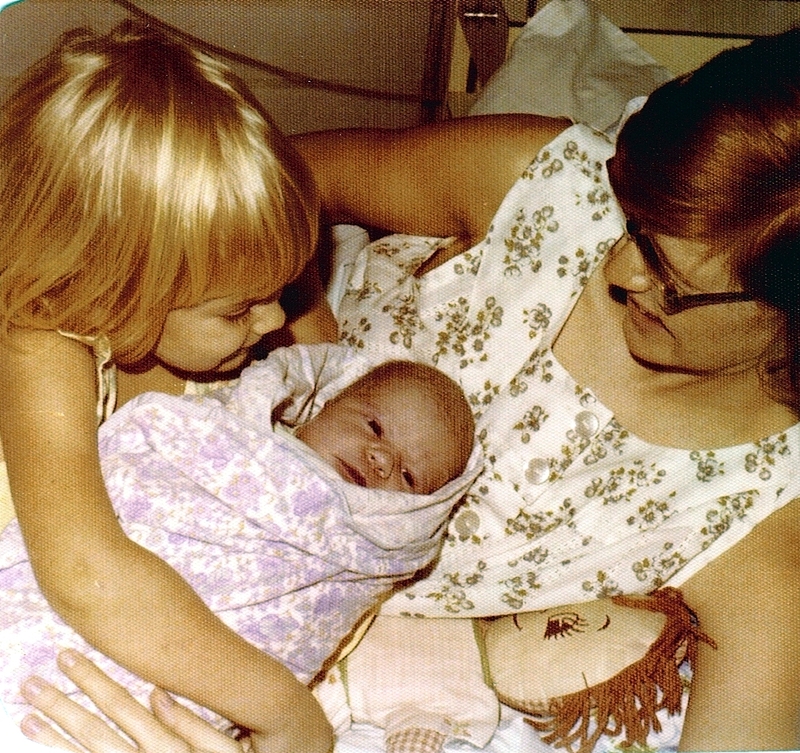 Two days before my third birthday, when Dad put you into my arms, I scarcely glimpsed the gift I was receiving. I knew this live doll who wiggled and woke and ate was a wonderful creature. I was happy to have a sister. I didn’t know I was being handed a person who would grow into one of my dearest friends, someone who would show me in a thousand beautiful ways what Christ looks like. It wasn’t long before we began to play school. I was the teacher, helping you learn to write your letters. I didn’t realize you were becoming my teacher, too, helping me sound out the meaning of the Word as I saw Him living in your skin. You kept loving me even when I didn’t want to wear matching clothes, and didn’t want you to play with me and my friends. You forgave me a million slights and pushing-you-aways, and never stopped believing in me or wanting to be near me. As you twirled and sang and made our new baby brother laugh with your silliness—”Mary had a little lamb, it’s fleece was green as peas”—you began a lifetime of helping me realize that God’s love is celebration as much as seriousness. In you I see how sacrifice and celebration can co-exist—how joy is not just the fulfillment but the fuel of costly love. When I returned home from Afghanistan too sick to shop for my own clothes, you put your fashion talents to work and brought home outfits for me to try. You sat on my bed while I rested, and brought your children to read with me. You taught them by your own love to love me, and they learned that we all have limitations and that mine didn’t make me any less precious. Almost every time I’ve returned home from a far country or the other side of this one, you have shown up at the airport or the house with a bouquet of flowers or a balloon and a hundred hugs, always delighted to have me home though you know it won’t be long before I’ll fly off again. You would love to keep me here close to you, but you have encouraged me to find my wings, to keep growing into the person God has made me to be. You have given me space when I needed it. You always think the best of me. You aren’t blind to my faults and weaknesses, yet somehow they don’t seem to matter much to you. Somehow—amazingly—you never make me feel as though I’ve been a disappointment. Your love makes space for all of me. You know your job is not to change me but to love me. And you never make me feel like you want to change me. Somehow, love like that does end up changing me, setting me free, because it opens up safe space for the real me to creep out of hiding and begin loving too. When I’m at risk of thinking I can understand grace by figuring it out, love like yours keeps me grounded. I have learned far more of what Christ looks like through your hugs and laughter and back rubs than through my careful thinking. Some mysteries can only be understood from the inside; love can’t be analyzed, only received. I can’t count the meals you’ve made, the gifts you’ve given, the cards you’ve created. And you’ve never made me feel like your extravagant love has cost you more than you wanted to give. Your love enables me to consider that God’s love just might not be a “have to” love but a “want to” love, an “I like you and love you and enjoy you and want to be with you and delight in you just as you are” kind of love. God knew I’d need to see that full-of-delight kind of love again and again to believe it, and you are one of the ways He keeps coming to me with flesh on to help me remember that this kind of love really does exist. So, dearest sister, thank you. You didn’t choose to be my sister. You did choose—and do keep choosing—to let your body and soul host Jesus so that your loving is not only yours but God’s, your face and arms and feet mediating divine grace. You are beautiful, dear sister, and I am so grateful for my third-birthday present. You remain a once-in-a-lifetime priceless gift that keeps growing and becoming more precious and treasured with every birthday that passes. Happy fortieth birthday, and here’s to an eternity of continuing to enjoy God and each other more deeply. I love you so much!